I went back to Doctor #1 after getting that lovely second opinion to discuss what Doctor #2 had said. Doctor #1 was visibly disturbed by what #2 had said to me. I recall him saying things like “irresponsible” and “ridiculous” after blurting out that #2 had been unprofessional. Doctor #1’s response made me feel better and we discussed my hip situation at length. All kidding aside, it’s important to discuss things with your doctors, to get second opinions, and to find a medical approach that you are comfortable with. I still remember vividly how scared I felt after seeing #2 and being told that any level physical activity was going to do me in. I’m glad #2 was wrong and I’m glad I have found a way to be a little healthy! If you have had a similar experience, let me know how things went in the comments below! The granola has been a challenge, though. 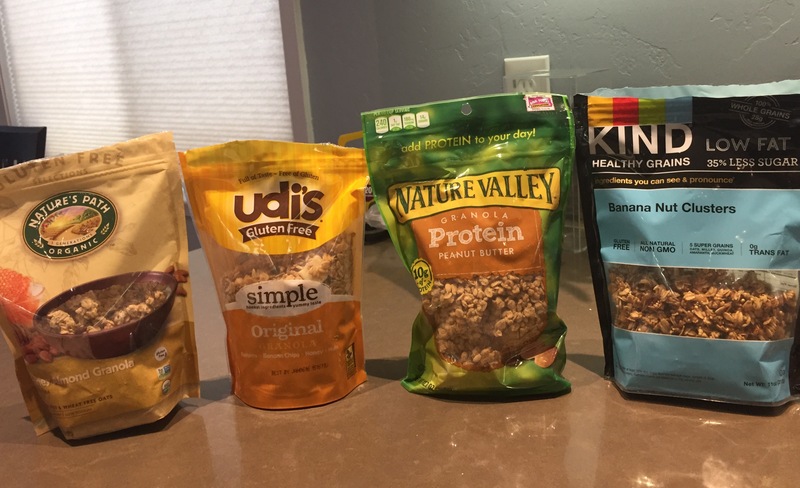 What to use, what to use… I’ve recently experimented with four different types of granola and wanted to share my thoughts. Here they are, in order of tastiness. Note: I’ve cherry-picked the nutrition information and it came straight off of the products themselves. My favorite of these four is the Nature’s Path Honey Almond Granola. It’s light and crunchy, a little sweet, great almond flavor. I could easily overdose on this stuff. The Udi’s Original Granola is very good. Not as light as the Nature’s Path, but something I could still happily eat my way through. It also doesn’t taste quite as sweet, even though the sugar content is about the same. The Nature Valley Granola was good. It didn’t have as many clusters as the first two, but tastes like peanuts/peanut butter – as advertised. Not something I want to snack on on it’s own, but it’s very good in the granola with cut up bananas. The Kind brand had good flavor, but it was really, really tough. Like, my jaws got tired chewing on it kind of tough. Can’t say I’d buy that one again. Do you have a favorite or go-to granola? If so, let me know in the comments. Would love to find more good options. So, I took Friday off… No exercise, just rest. I was feeling very tired and fatigued after my latest runs. I’m training for a half marathon and am five weeks away from the big day… And, I really want to do well. Doing well for me means running the entire 13.1 miles, slow or not. The last time I did a half marathon was bad – My right calf cramped up horribly and I hobbled most of the way. Volunteer staff had to help me roll out the cramp in my calf and give me a salt packet so I could finish. That is some primo motivation to train better! I feel like I’m back on track – I’m taking my rest days seriously. Especially now that my Sunday runs are ramping up. I’m beginning to think I’ll hit my goal for the half. I don’t want to get too cocky yet though. I did manage to snap a couple of pictures yesterday. 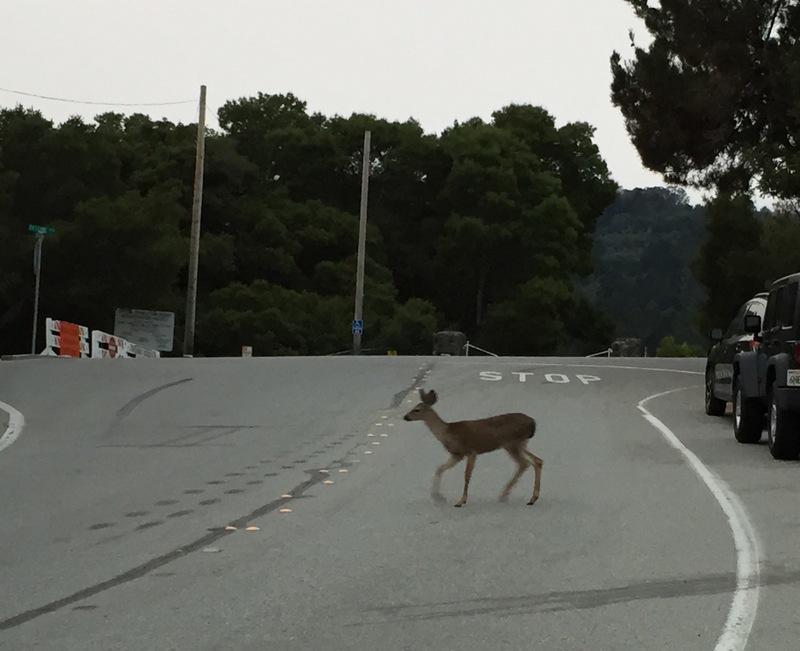 In the first picture is one of the baby deer crossing the road as I parked the car. 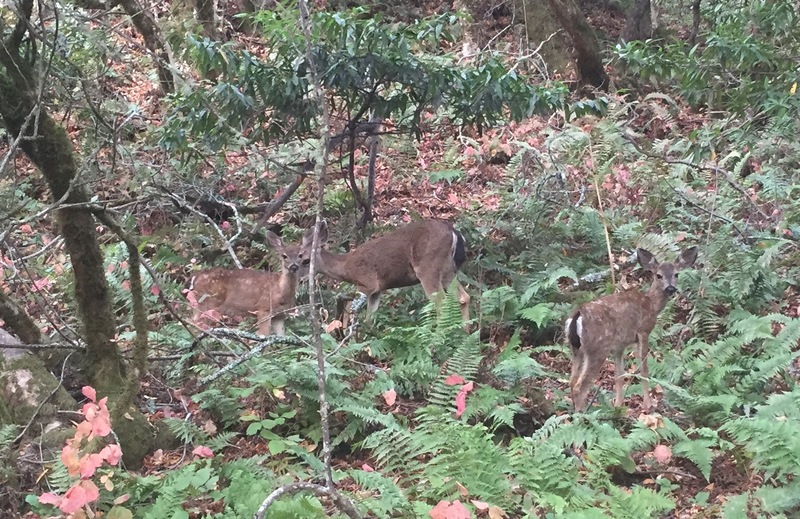 In the second picture, there are three babies – nicely camouflaged! Behold the cuteness! On Sunday, I was supposed to run 8 miles as part of my half marathon training program. I managed around 7 1/2 – mainly because I was traveling (Labor Day weekend). But, not hitting my goal really gave me a sense of disappointment. I should have planned better, should have mapped out a route better… Blah blah blah. On Tuesday and Wednesday, I was able to get through my 4-mile and 6-mile runs pretty well. My quads were sore on Wednesday, but that’s nothing new… Then, Thursday hit… I had some pain at the beginning of my run and had to walk for a bit. I was worried it wouldn’t stop, but it did and I was able to get through my 4-mile run. But, wow! I was really feeling tired. More disappointment. Last night, I put some Salonpas on my quad and went to bed as early as I could. Today is a non-running day, but I also decided to make it a non-workout day because I am tired and frustrated with my recent performance. So, while at first, it felt like defeat, I really think I did the right thing. If I don’t listen to what my body is telling me, I won’t be able to go further and do it healthy/without pain. My stubborn side lost today and I’m glad. I am resting up so I can do my 4-mile on Saturday and my 9-mile run on Sunday. I’m going to break on through to the other side and get myself back in the groove. Deep breaths… Enjoying the break… Onward tomorrow. From the time I get up in the morning until about 6:00pm, my appetite is under control (aka, pretty normal). I eat breakfast, lunch, have a small snack in the afternoon and all is good with the world. Then, 6:00pm rolls around and the snacking begins. I think maybe this started as a result of cooking dinner for my son, who eats at 6:30pm. Before he arrived on the scene, I used to eat dinner around 7:30/8:00pm and don’t really remember snacking so darn much. Now, I eat dinner with my son, but that only partially explains the snacking… I mean, I get that I may be getting hungry around 6pm while I’m cooking, but what the heck is going on after dinner? I struggle (and I really mean struggle) with the desire to snack on generally unhealthy items from 6 until about 9pm. I can’t have chips and cookies in the house because one turns to two, two turns to 50. I wish that were hyperbole. On the days I get my snacking under control, I still find myself at the refrigerator door or the pantry door looking around. I sometimes lose track of how many times I check for a snackable morsel. On the other days, I find salty or sugary snacks and try to stop after one or two, but generally eat way more than I should.